Two Feet and Tough The Grass, ‘Dwarf Fountain Grass’, Pennisetum alopecuroides ‘Hameln’, is a great grass for a specimen or in mass plantings. The leaves are narrow and arch. The seed-heads resemble bottle brushes which are a rose copper bristly head. It truly gives a fountain like appearance. The mature flowers last until winter freezes shatter the seed heads! It is only 2′ tall. 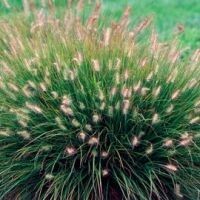 Ornamental Grasses are gaining in popularity all over the U.S. due to their undemanding nature and long lasting, year round beauty. There is nothing that adds such interesting forms, textures and movement to a garden, than with this diverse plant group. They can be planted along banks of ponds, incorporated into perennial gardens, grouped together, utilized as a ground cover along walkways, paths or on steep banks. They aren’t fussy about soil requirements, are drought tolerant as well as insect and disease resistant. Dwarf Fountain prefers full sun and well drained-soils. If planted in partial shade, little or no flowering will occur.